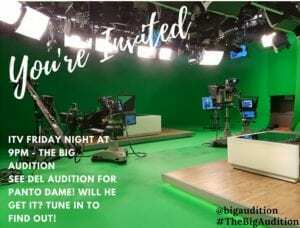 When he’s not behind our reception, Del Willden has been behind the cameras on ITV’s The Big Audition. Del Willden the person behind Wirral’s Beverly Macca is set to feature in a new ITV series called The Big Audition. Del will be seen going through the audition process to become a panto dame. The Big Audition is a brand new factual entertainment series that goes behind the scenes of the casting world. The Big Audition witnesses real people being cast for real jobs, which have the potential to be life-changing. The casting panels will be searching to fill all sorts of roles and anyone can audition, from seasoned professionals to first-timers. This fixed rig programme will uncover the decision-making process of the panels and will transport us through each audition to reveal what really goes on in the casting studio. Through intimate interviews, viewers will hear heart-warming, funny and touching backstories. There will be highs and lows along the way, but who will have what it takes to land the job of their dreams? The Big Audition started on Friday 5th October at 9.00pm on ITV and runs for 6 weeks. Del will feature in Friday 19th October’s episode.